Papayas are known as medicinal fruit and also for their ability to tenderize meat. All the parts of this tropical fruit -- pulp, seeds, latex and leaves -- contain a number of enzymes that may help aid digestion, improve blood sugar levels and speed skin healing in some cases. The papaya fruit has been proven to be safe to eat, however, its concentrated extracts have not been clinically studied to rule out adverse effects. Consult your doctor before using papaya enzyme supplements to treat any type of condition. Carica papaya lipase is an enzyme found in the papaya fruit that may help digestion. A 2009 study published in the journal "Food Chemistry" found that this enzyme digested dietary fats called triacylglycerols in a lab environment. This papaya enzyme showed similar effects to natural pancreatic enzymes, which break down fats in your body. Taking a papaya enzyme supplement that contains C. papaya lipase might be beneficial for people with digestive problems due to a pancreatic disorder. However, further research is needed to determine if papaya enzymes have the same effect inside the body. Research conducted at the University of Illinois found that papaya fruit contains an enzyme called papain. This compound has proteolytic properties, meaning it can break down the proteins found in foods such as meat and poultry. The study concluded that papain is found in both unripe and ripe papayas, but may have stronger protein-digesting activity in ripe papayas. Papaya enzyme supplements that contain papain may help improve your protein digestion. Papaya enzyme supplements may also help fight intestinal parasites, particularly if they contain extracts from the seeds of this tropical fruit. A 2005 study published in the "Journal of Medicinal Food" reported that both papaya fruit and seeds have anti-parasitic activity. The researchers tested the effect of papaya seeds on 60 Nigerian children who had evidence of intestinal parasites in their stool samples. Children who were given a dose of 20 milliliters of air-dried papaya seeds were clear of the parasites after a 7-day period. 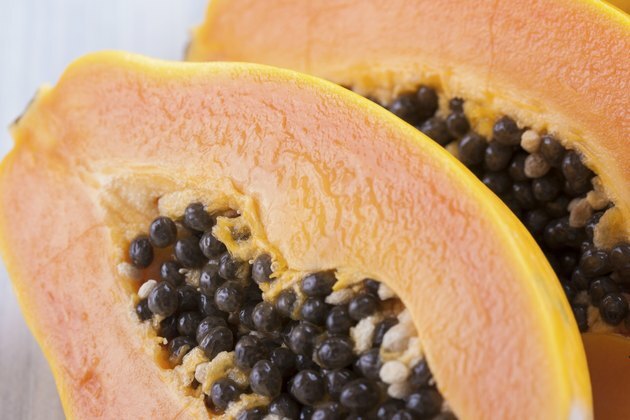 Further studies are needed to confirm the research, but papayas' fruit and seed extract could help treat potentially fatal parasites in both children and adults. If you have diabetes, wound-healing may be slowed due to complications of imbalanced blood glucose levels. An animal study published in 2010 in the journal "Antioxidants and Redox Signaling," reported that fermented papaya preparation helped improve wound healing in obese, diabetic adult mice. The mice also showed improved blood glucose control and reduced blood cholesterol after being fed the papaya supplements for 8 weeks. Clinical studies are needed to find out if papaya preparations have similar benefits for people and if there are any side effects. Can Certain Foods Kill Intestinal Parasites?